The local Church dressed up dead Pope Celestine V to please Pope Benedict. The pontiff came to pay the skull and bones of Celestine a visit. 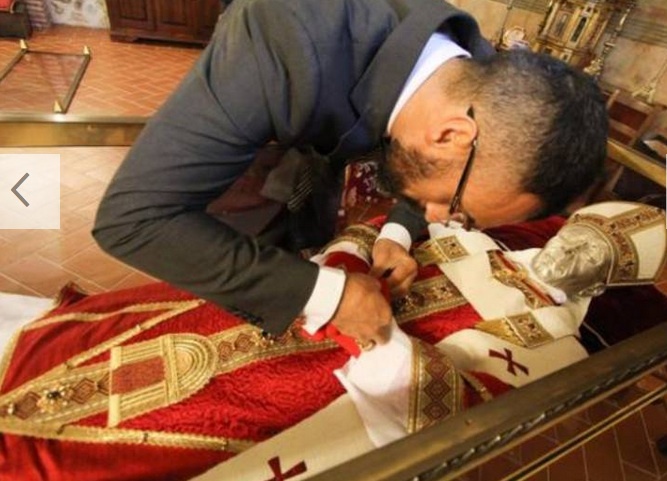 A local Catholic in Central Italy dress up a dead Pope with the garments gifted by Pope Benedict. A lot of work had to be done before Pope Benedict came to St. Maria of Collemaggio Church in L’Aquila in central Italy, on 28th of April 2009. Pope Benedict and his read shoes. 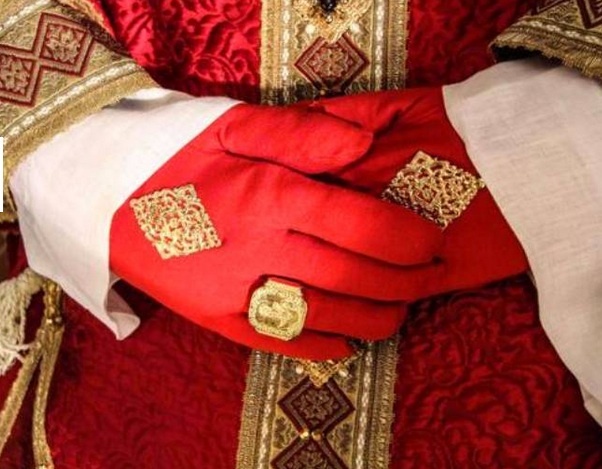 A new pallium, a full set of vestment had been offered by Benedict. The local Church officials literally had to dress up the skeleton with new garments. 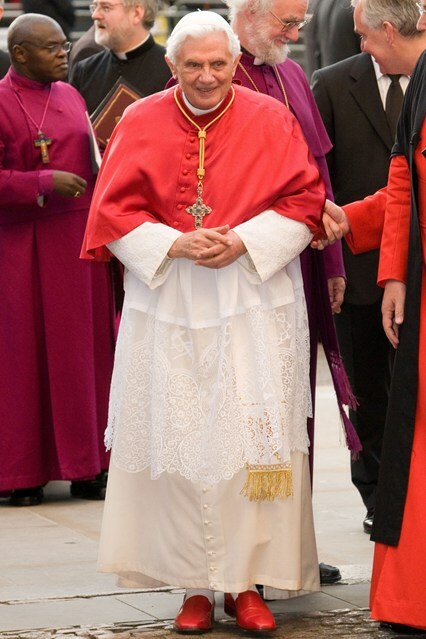 The dead Pope even got red shoes, which matched one of the pairs used by Benedict. In 2013, Pope Celestine also got a new face. 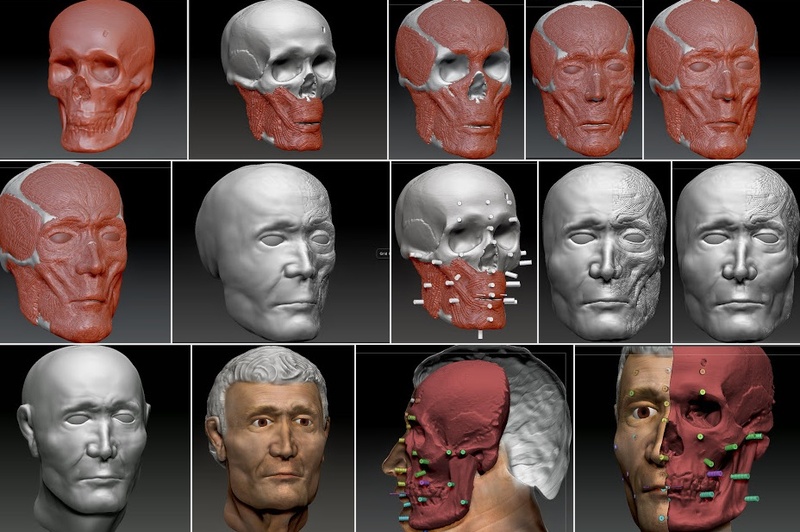 By making new 3 diminutional images of his skull, the Roman Catholic doctors were able to reconstruct his face. 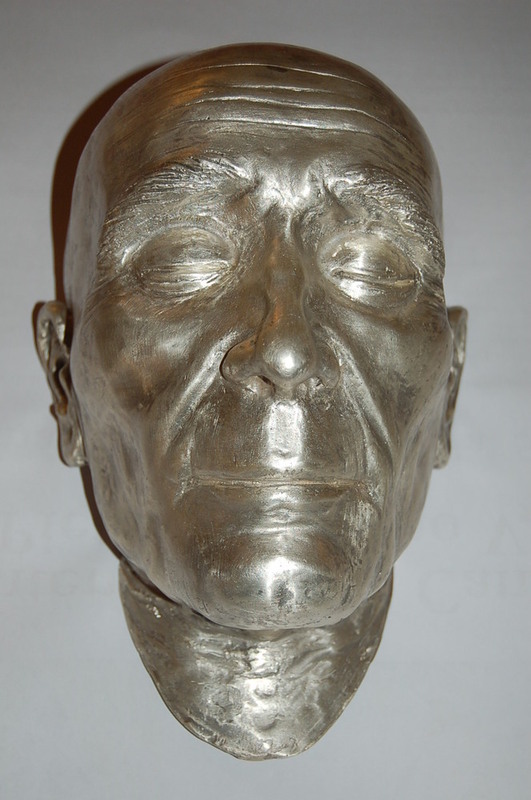 An old wax mask was removed, and a new death mask in silver was representing the Pope’s head. Interestingly the old mask had the appearance of Cardinal Carlo Confalonieri, (March 27, 1941 to 22 February 1950). 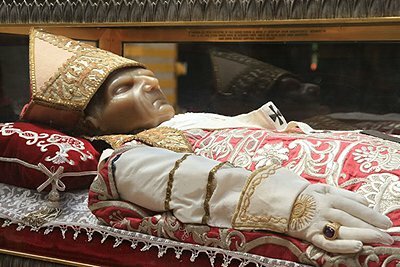 The bones of the dead Pope were not covered, and some Catholics got embarrased and complained to the local archbishop. 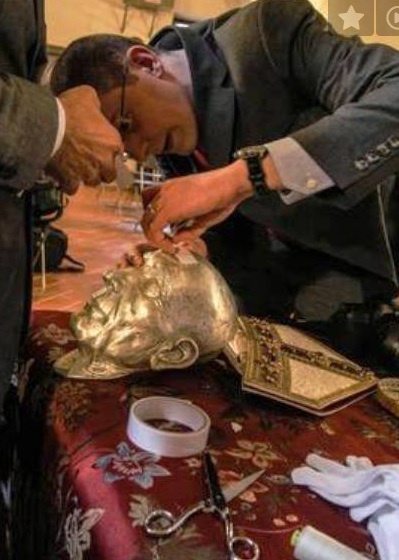 A new death mask is placed over the skull. The old wax mask was was made to look like the face of a Cardinal Confalonieri who died in February 1950. 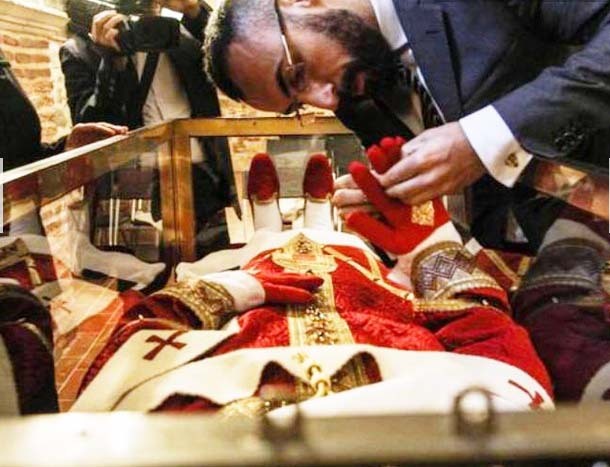 When Benedict came to visit the dead Pope, his new pallium was put on. But not the new face. The shoes and gloves of the papal doll were still white. 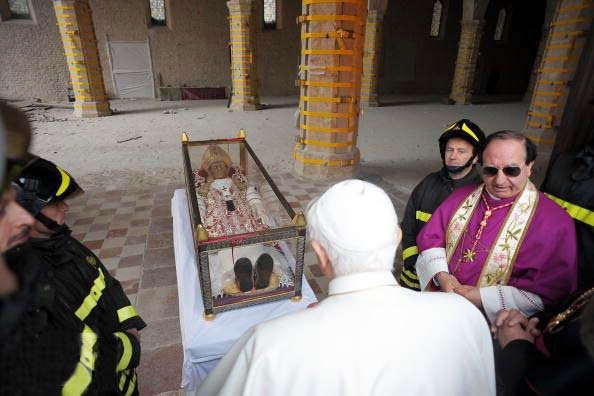 Pope Benedict came to pray to the skull and bones of a Pope who has been dead for almost 700 years. The new mask fitted perfectly to the new garments. The new look of the Pope. Even a copy of the ring of the fisherman is put on gloves. Even vax figures of dead Popes need to have the ring of the fisherman, a ring with a golden image claimed to be of the Apostle Peter. It require a lot of patience to dress up a dead Pope. From where did they get the idea of putting red shoes? 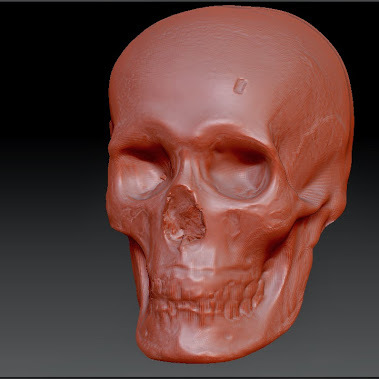 This three dimentional image of the skull was used by the Catholics to reconstruct the face of the Pope. 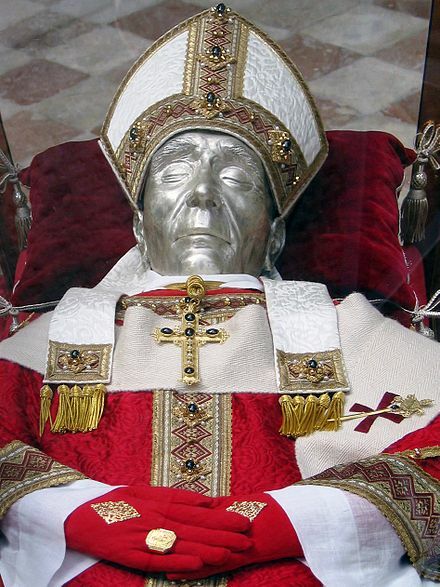 This silver colored death mask of the Pope now cover the skull. The Roman Catholic chuch spends lot of money on modern technology to preseve skull, bones and corpses. 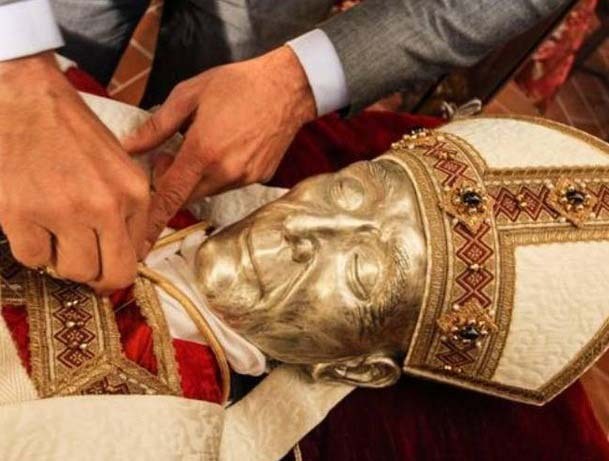 This is the process of reconstucting the face of a dead Pope, so he can be worshiped. 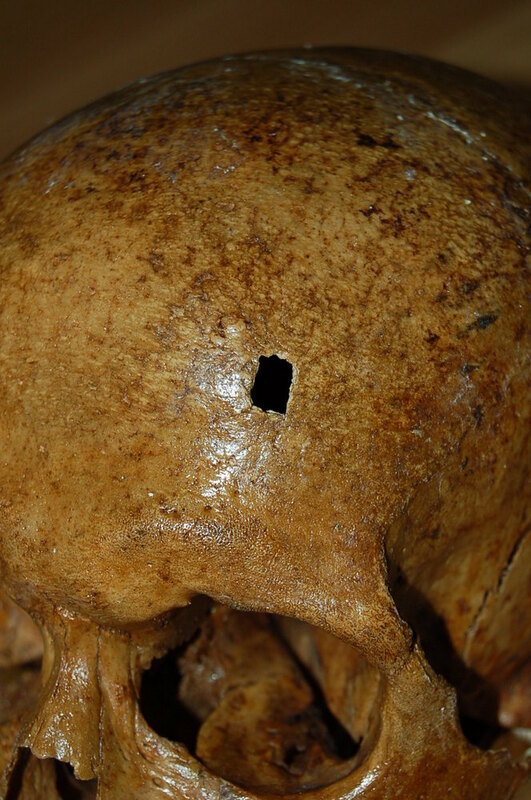 The hole in the skull of Pope Celestine V made many speculate in his possible murder. The RCC claims it is a damage done during one of the many occations of the corpse being exhumed. A Pope killed by the next Pope is not a good testimony of holiness. The local Roman Catholics were not happy with the reconstruction work. 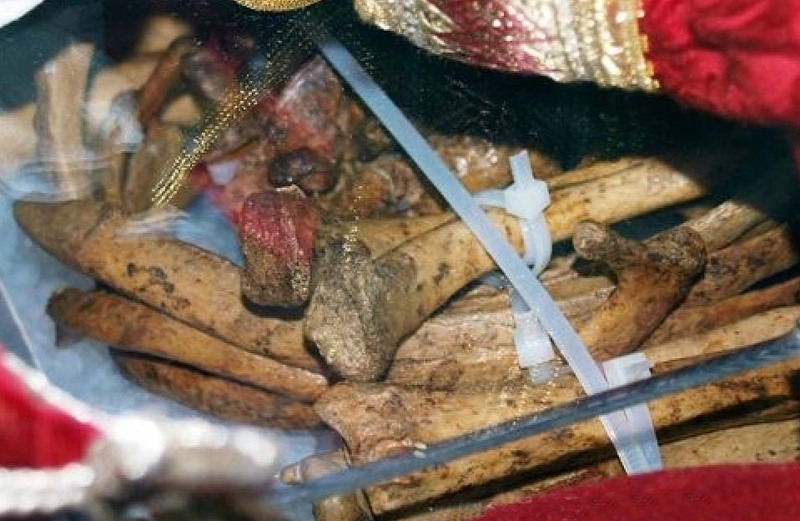 The skeleton of the Pope Celestine was not reassembled. The bones could be adored from their location under the wax-figure. The Local archbishop was questioned by an Italian magazine why the skeleton had not been restored to its original shape. This story do not need any further comment. The photographs can speak on its own. To the Roman Catholics who just read this article. What is the meaning of R.I.P, written on the graves? Why is it impossible for you to leave the dead alone? Redistribution of wealth should start at the Vatican- this is an abomination. God will not be mocked.!!. The crimes of the RCC has not been properly recorded on Earth. In many nations, the official history has been presented by priests and bishops. But these criminals will not escape. They will face the place of eternal horrors, their names not being written in the book of life. Please explain the full meaning of Luke 9:60 to us. What is your interpretation of this verse? These are obviously people who are physically alive, put spiritualy dead. They have not been born again by the Spirit of God. They believe that the dead rest or sleep in their graves, and pay attention to bones, skulls and corpses. Not understanding the victory Jesus gained on the cross, nor walking in the power of His resurrection. You must repent, or you too will perish.